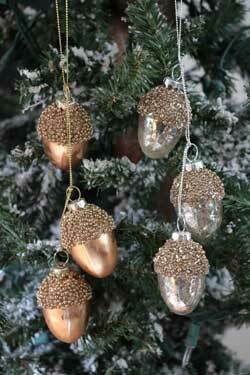 Gold & Champagne Ornaments - glass, shatter-proof, metal, ALL ornaments that are shades of gold / champagne! 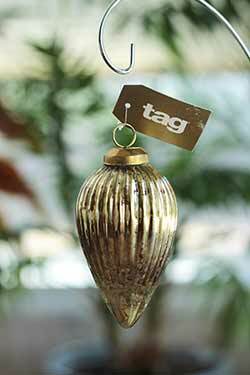 Thin tin word ornament, covered in gold glitter with hanging wire. 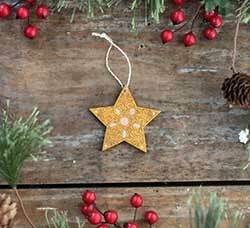 Great for a country primitive Christmas tree, garland, or wreath. 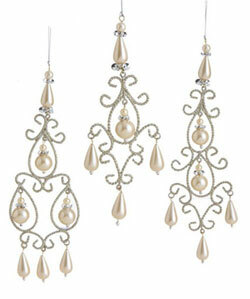 Sparkling metal scroll design with hanging pearl accents. 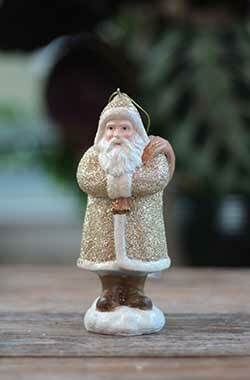 Part of the C'est Noel Collection. Owl Clip Ornament, by Raz Imports. 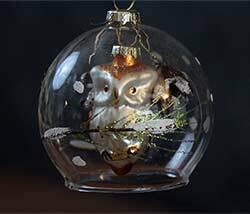 Beautiful mercury glass owl-shaped ornament accented with touches of glitter. 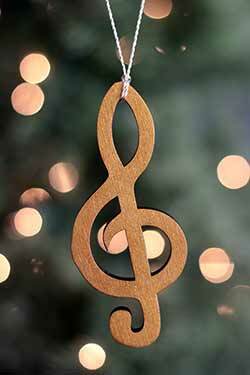 Clips to a twig or branch, and would make a sweet accent for Christmas or year round! 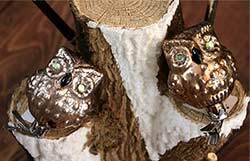 Sold individually - The Owl on the left is a lighter shade brown/gold, with champagne colored glitter; the Owl on the right is a darker shade of brown/gold with brown colored glitter. Measures approx 3 inches tall. Made of glass. 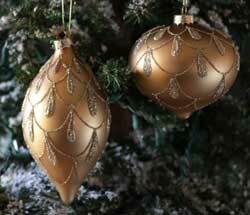 Matte gold glass ornament with gold glittered details. 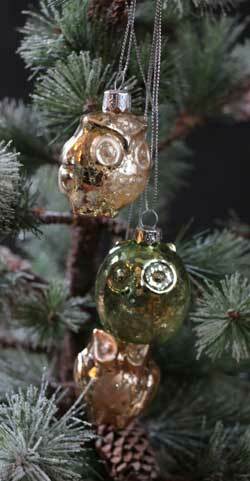 Sold individually - Choose the Left (Drop) or Right (Onion) ornament. Gold cap and attached ring for hanging. 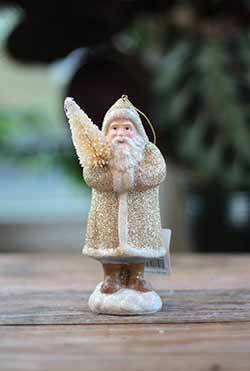 This is for the Gold ornament. 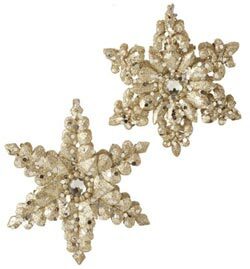 Gold Jeweled Snowflake Ornament, by Raz Imports. 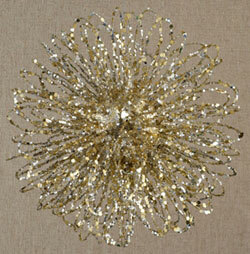 Gold and silver wire starburst ornament accented with gems and glitter. 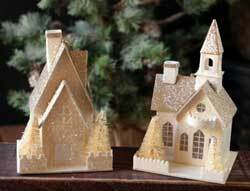 Sold individually - Choose the Left or Right ornament. Measures 6 inches. Part of the Champagne Frost Collection. 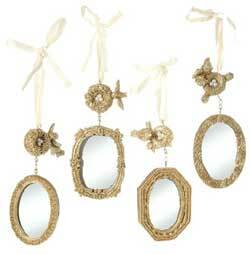 Gold Mirror Ornament, by Raz. 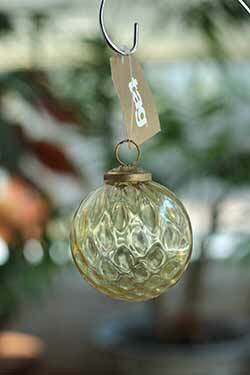 Golden resin mirror ornament, beautifuly refracts light. Accented with bird/nest details. Sold individually from the four slightly different ones shown - Choose the ornament from left to right - A, B, C, or D. Part of the Christmas Conservatory Collection. Measures 5 inches. 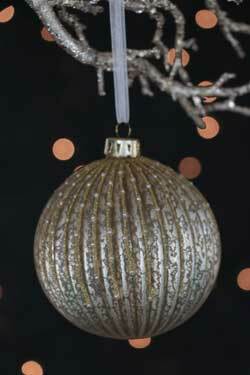 Gold or Green Glittered Ball Ornament, by Raz. 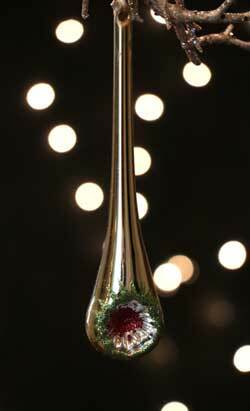 Gorgeous, rippled glass with mercury finish. 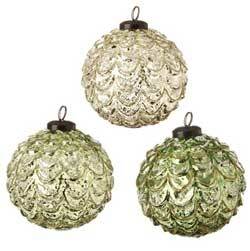 Sold individually from the three shown - Choose the Left (light green), Middle (pale gold), or Right (darker green) ornament. Measures 4 inches. Part of the Emerald Cottage Collection. Made of glass. 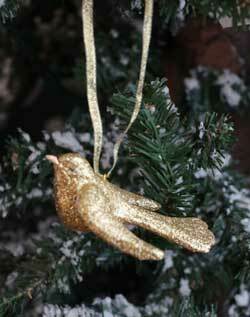 Beautiful gold squirrel ornament - body has an antiqued mercury finish, tail is glittered, acorn is a darker brown glass. Measures 4.5 inches long. 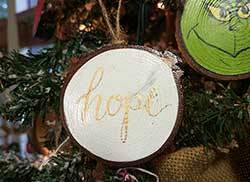 The perfect small gift for a friend who needs encouragement, or group gift for your bible study friends! 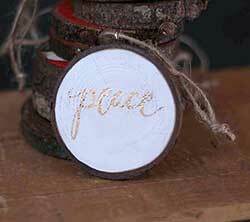 Reads: "peace" in metallic gold hand-lettering against a white background. 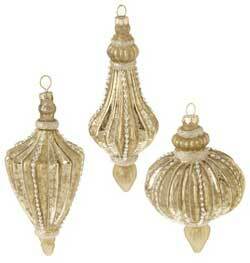 Embrace the glamour and glitz of white Christmas with the Shimmer Burlap Creme Ornament collection. 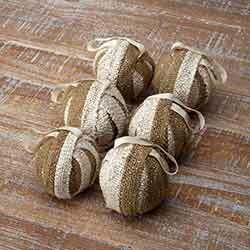 Metallic silver threads are woven through creme burlap for a shimmery finish, the perfect decor to host a sophisticated holiday party.